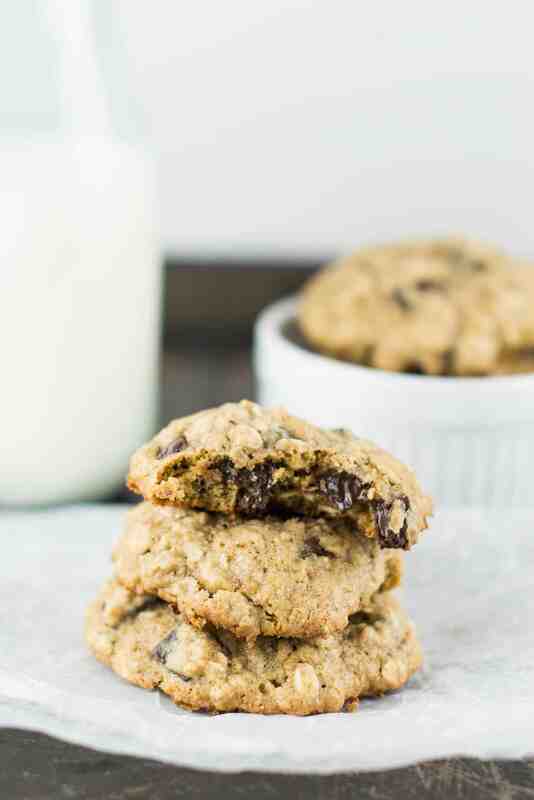 These oatmeal chocolate chip cookies are a favorite of mine. Soft, chewy, and perfectly sweet while not too sweet. 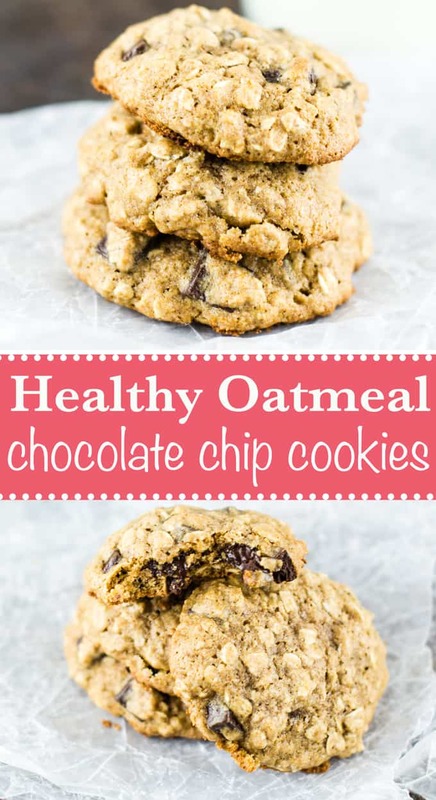 They are made with wholesome ingredients like coconut oil and rolled oats, and have a lot less junk than “regular” chocolate chip cookies. They freeze like a dream, and are so fun to bake up fresh for a single serve dessert. I frozen my extra batter in balls on wax paper and placed them in freezer safe ziploc bags. Just remove how many cookies you want for dessert, and bake fresh from frozen! These cookies are so soft that you can bake them straight out of the freezer without thawing and they will just be slightly crispy. These were a LIFESAVER after our son was born! We would take a few out of the freezer each night and they were incredible. I used a mixture of coconut oil, olive oil, and applesauce to add extra nutrition and softness to these cookies. 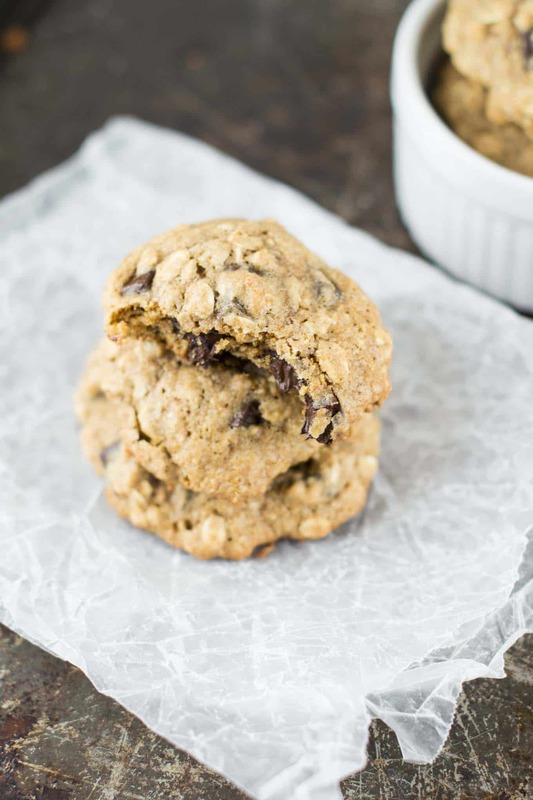 They are sweetened with organic cane sugar and sprinkled with dark chocolate chips, making for a sweet but not overly sweet cookie. I really can’t get enough of these and I am planning to make another batch tonight! 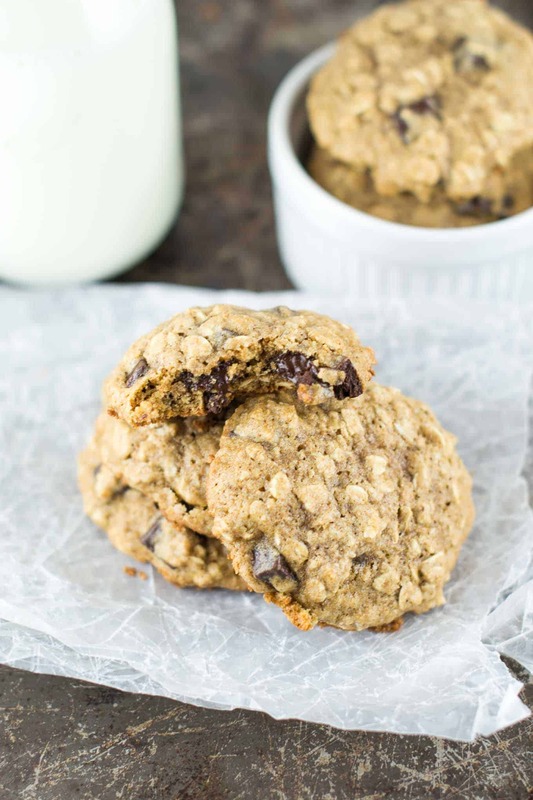 If you love a really good oatmeal chocolate chunk cookie, then these are for you too! 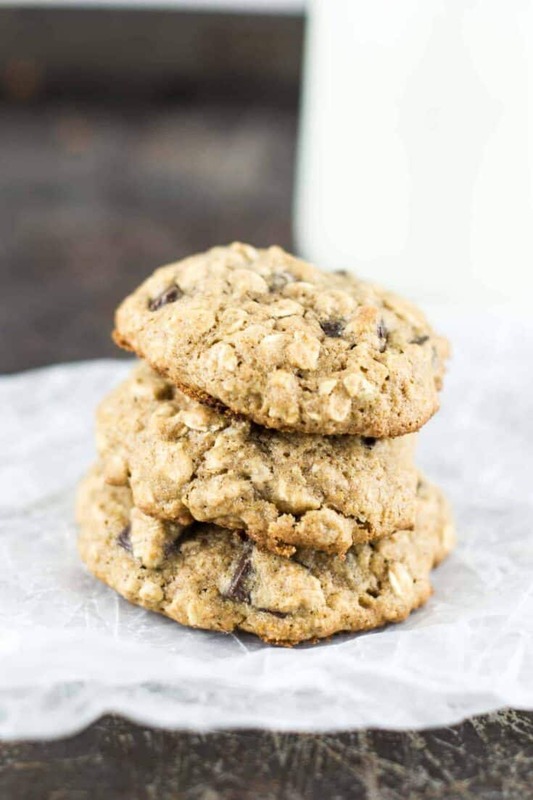 A recipe for Healthy Oatmeal Chocolate Chunk Cookies made using whole wheat flour, coconut oil, and other whole food ingredients. Combine oat flour, whole wheat flour, salt, and baking soda in a bowl and whisk well. Beat sugar, olive oil, coconut oil, applesauce, and vanilla extract in a large mixing bowl. Add dry mixture to wet, beating to combine. Stir in rolled oats and chocolate chunks. Drop by spoonfuls onto a greased baking sheet. Bake at 350 for 10-14 minutes, or until done. This cookie looks wonderful and I want to try it however I’m afraid to advertise it as “Gluten free” since you use wheat flour. Do you have a suggestion for another flour that would work?